Step 2 Place the butter in a small bowl and melt in the microwave. Set aside. Step 3 In a large mixing bowl, combine together the sugar and yogurt. Now add in the semolina, baking powder and milk. Finally stir in the melted butter, and let the mixture sit briefly so that the butter is absorbed. Step 4 Transfer the semolina mixture into a lightly greased 9″-round cake pan or baking dish. Bake in the 350 degrees F-heated oven for about 40-45 minutes. If necessary, broil ever so briefly so that the top of the basbousa gains color. Watch carefully. When ready, remove from oven. Step 5 While the cake is baking, prepare the cinnamon simple syrup. In a small sauce pan or pot, combine the sugar, water and cinnamon stick. Bring to a boil on high heat, stirring until sugar dissolves. Turn heat to low and let cook for a few minutes until the syrup thickens. Remove from heat and stir in the lemon juice. Let cool completely, then remove the cinnamon stick. Step 6 As soon as the basbousa is removed from the oven, pour the cool syrup on the hot basbousa. Let cool completely; syrup must be absorbed into the cake. For best result, let it sit for 1 hour before serving. 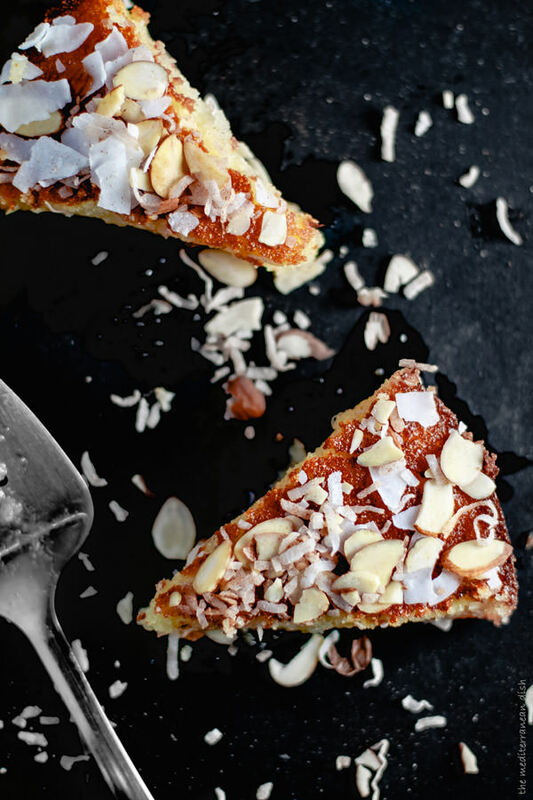 Step 7 When ready to serve, top the cake with the coconut chips and the coconut and shaved almonds. Slice and enjoy! It has been a while since I shared a dessert recipe here on the blog, so much for challenging myself to more baking! So, how about a little basbousa? Basbousa is an Egyptian semolina cake drenched in syrup. Today, I’m sharing my aunt Maha’s special recipe!